Do you know what that is? That is a tiny piece of cheese. 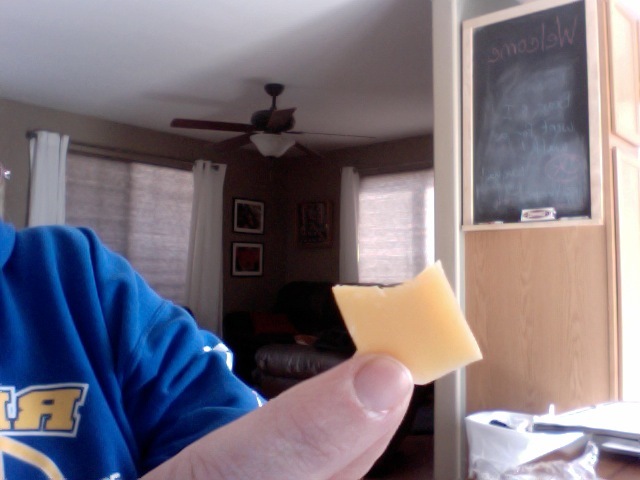 The last tiny bit of a chunk of cheese I will miss horribly. The name of this amazing cheese is Reypenaer. "Reypenaer cheese, one of the great Dutch cheeses, is carefully matured for about one year. This Dutch gourmet cheese is aged less than the Reypenaer Ysop, although it is already very old as cheeses go. It does not have the sharper tangy taste of the Reypenaer Ysop, instead it has a soft and creamy flavor that lingers on the palate. Simply delicious!" You know what I say about this cheese? If I can't find it anywhere anymore I will die. This cheese is the love child of a really good smoked gouda and a really expensive parmigiano reggiano. I think it is pretty sharp and tangy- even if the wrapper disagrees with me. I found this in the fancy cheese section of the Montrose City Market. I hope I can find it somewhere nearer to Rifle. This was so good, I'd be willing to order it on the internet. And pay horrible shipping charges. And suffer the jeering of all my friends. This isn't the sort of cheese you grate over nachos. This cheese is to be enjoyed in small amounts, with a glass of wine. The flavor is strong and assertive. I doubt it would play well with others. If you are a lover of cheese- you owe it to yourself to track this down and try a little. I promise you won't be disappointed! Ben- you might try artisanalcheese.com. I haven't looked there yet, but if you really want to try it, that's where I'd start looking.